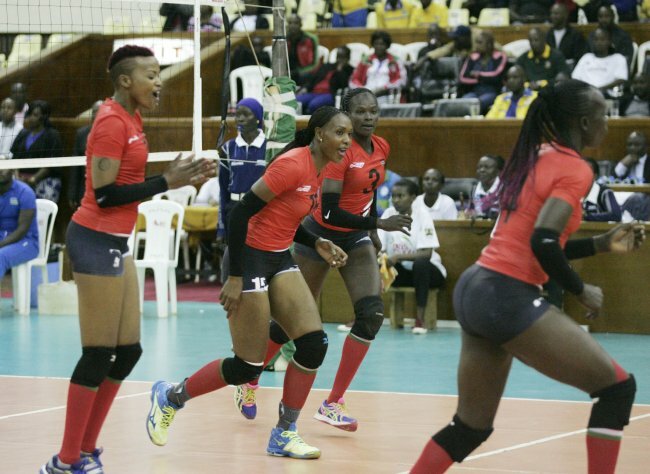 Defending champions Kenya and hosts Cameroon booked their place in the final of the African Women's Volleyball Championship after semi finals wins on Friday. As a result of winning their semi final matches, both teams have sealed a spot at next year's World Championships in Japan. Kenya, who are seeking a fourth continental title in a row, saw off Egypt in straight sets at the Yaoundé Multipurpose Sports Complex in Cameroon. They won 25-23, 25-22, 21-19 and are yet to drop a set at the tournament. Cameroon kept their hopes alive as they saw off Senegal, also in straight sets. They came through 25-19, 25-20, 27-25 to bag the second continental ticket. Fielding the same side that beat Tunisia in their last Pool B match, Kenya trailed for the better part of the first set 4-7 before a good combination between Noel Murambi, Evelyn Makuto and Jane Wacu closed gap. However the efforts were not good enough to stop the North Africans from taking a 8-6 lead at the first technical time out. Egypt continued with their good run to again lead 16-14 in the second TTO before Kenya found their footing with Wisa, Makuto and Brackcides Agala contributing points at will, enroute to bagging the first set. In the second set again, Kenya played catch up, trailing 5-8 in the first TTO before Wacu, Mercy Moim and Agala contributed points that saw Kenya overtake their opponents to lead 16-14 at second TTO. Egypt would lost steam as Kenya tormented them with well-oiled spikes and tight blocks that saw them lead 20-18 before sealing the set 25-22. The third set was where the Malkia Strikers came hard on their opponents-taking the lead from the beginning to the end. They led 5-0 and 8-4 at the first TTO. Murambi and Makuto returned to haunt the depleted North Africans as Kenya led 16-11 at the second technical time out. Agala, Wacu, Makuto extended lead 22-18 before Kenya coach Munala rested Moim for Leonida Kasaya and Kenya banked on the four point lead to easily take the final set 25-19.